Salesforce.com Inc. (CRM) stock rocketed skyward on Wednesday. Shares of the San Francisco-based cloud giant shot up 10.25% on the day, finishing at $140.64, after Salesforce reported top- and bottom-line beats in the third quarter on Tuesday. The recorded revenue of $3.39 billion marked a 15% increase year over year and beat the consensus of $3.365 billion, while adjusted earnings per share of $0.61 exceeded the consensus by $0.11. A major factor in the stock's strong rise was the decision by executives, including co-CEOs Keith Block and Marc Benioff, to raise their guidance despite concerns about a global economic deceleration ahead. "Given the strength of this quarter's results and the incredible customer demand we are seeing, we are again raising our FY19 revenue guidance and initiating our full year fiscal 2020 revenue guidance at $16 billion at the high end of the range," Block said in a statement. "Companies across every industry, in every geography have a mandate to digitally transform their businesses and are turning to Salesforce as a strategic partner." Benioff noted that if the company is able to meet this mark it would become the fastest enterprise software company in history to cross the threshold. Jim Cramer's Action Alerts Plus Portfolio team, which holds Salesforce stock in its charitable trust, noted the importance of the guidance figures in their take on earnings. "One of the knocks against the stock during its horrific ~20% decline from its October high had been that enterprise spending would slow along with the global macro fears; however, management shut down those fears with its fiscal 2020 guidance," the team wrote. Wall Street analysts also picked up on the company as a leader in the software space and its ability to capitalize on demand even amid a possibly more turbulent market. "The engagement market currently suffers from technology sprawl and poor user experiences, and this is compelling organizations to modernize to next-generation systems like CRM's," Oppenheimer analyst Brian Schwartz wrote in a note on Wednesday. 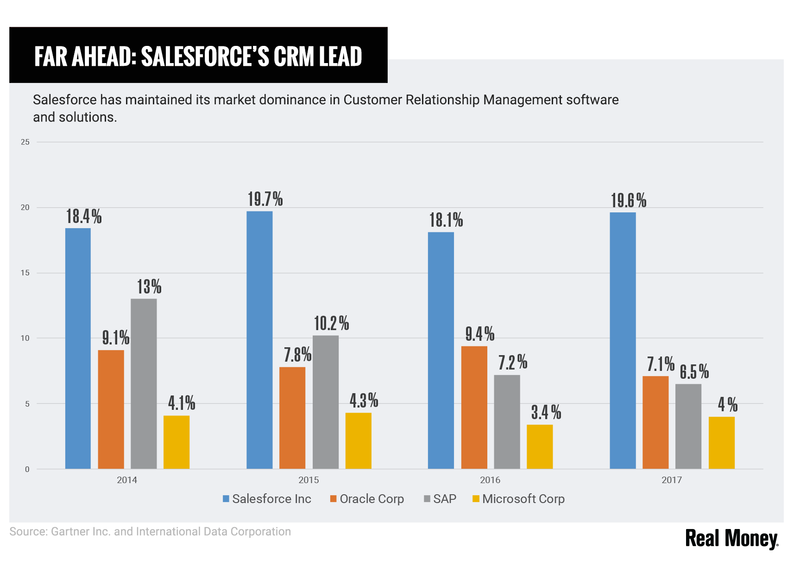 "While macro headwinds could hamper new software purchasing trends, we expect modernizing for customer engagement to remain a top software spending priority in 2019, and this causes us to favor CRM in large-cap technology." Schwartz set an "Outperform" rating and a $180 price target on Salesforce ahead of what he expects to be a "relief rally" for the leader in the software market, a sector that should sidestep slowdown concerns and keep Salesforce as a stalwart. Helping edge the stock higher into a remarkable afternoon rally were unexpectedly dovish comments from Fed chair Jerome Powell. "It is important to distinguish between market volatility and events that threaten financial stability," Powell said. "Large, sustained declines in equity prices can put downward pressure on spending and confidence. From the financial stability perspective, however, today we do not see dangerous excesses in the stock market." 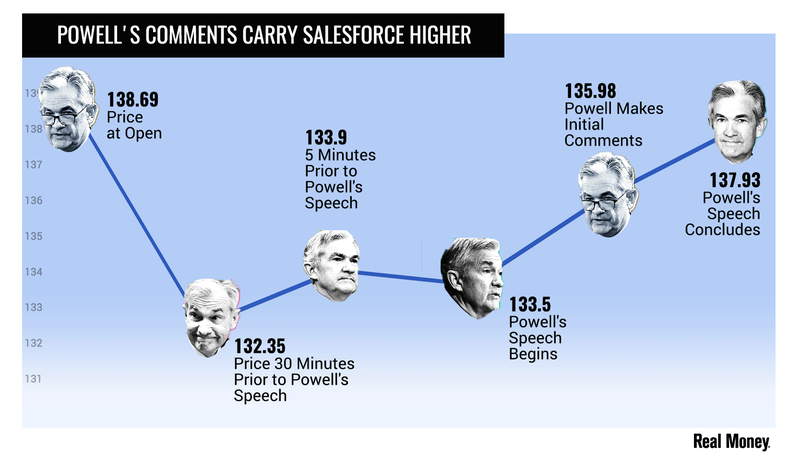 The comments suggest a slowdown in the Fed's plan to raise rates rapidly into 2019 which whipsawed the trajectory of stocks like Salesforce, which had pared gains at the time. "With the [Fed] "adjustment", how's that for a diplomatic reading - we got sent back into bull market mode and not only did we see a remarkable resurgence in the stock of Salesforce, all of the cloud kings exploded higher," Cramer wrote in his take on Wednesday. Indeed, stocks like Twilio (TWLO) and Adobe (ADBE) readily marched higher on the news. The "Powell Pump" could lead in a Santa Claus Surge if the markets reaction today is any indication. The December Fed meeting will certainly be a tipping point to monitor. To be sure, there was some concern that macro factors are being overlooked, tariffs in particular. In fact, there were two analysts who even cut price targets noting that the stock "is not immune" to the macroeconomic overhang that has bullied many stocks downward in recent months. For the time being, the market is not overly concerned as the bulls seized the day on the bounce for Salesforce's secular story. Shares continue to carry upward after hours. Jim Cramer and the AAP team hold a position in Salesforce.com for their Action Alerts PLUS Charitable Trust Portfolio . Want to be alerted before Cramer buys or sells CRM? Learn more now.